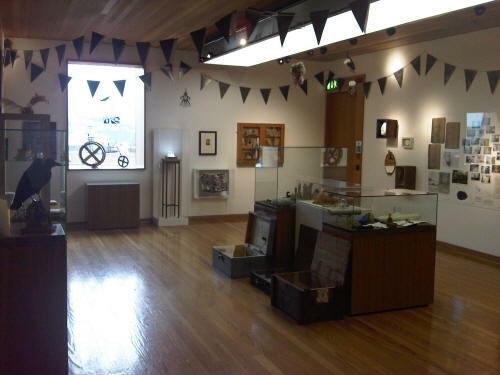 RW How did the Exquisite Trove show at Newlyn come about? Will it be similar in concept and appearance to the Walsall show? AH Exquisite Trove was commissioned by The New Art Gallery Walsall in response to The House of Fairy Tales cabinets of artist's curiosities which have accompanied exhibitions of the HoFT print portfolio at The Royal Academy Original Print Fair, Zoo Art Fair and Rochelle School Gallery. The exhibition at Newlyn will include most of the collection from the Walsall show, with a few additions of artist's curiosities and of course artefacts selected from many West Cornwall museums. The term Exquisite Trove was coined to combine the spirit of the Surrealist's game Exquisite Corpse with the depth, wonder and sense of discovery of a 'treasure trove'. The exhibition is essentially in the style of cabinets of curiosities, but with a fresh title that also allows for a more playful and less controlled curation process. 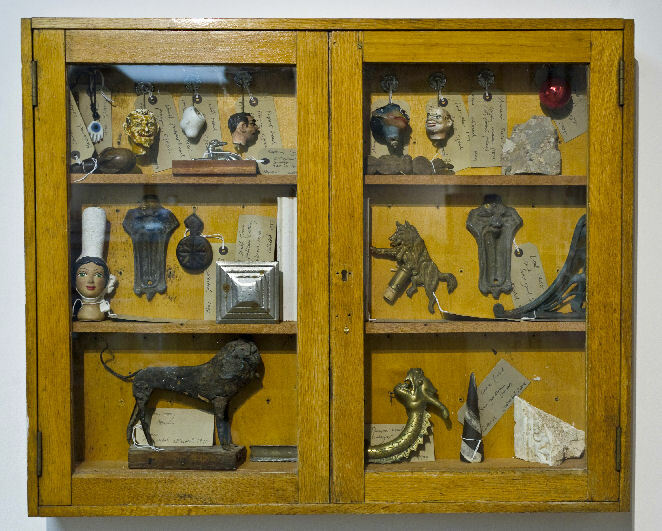 The curation occurs in the choice of participating artists (those who find the 'door' to The House of Fairy Tales) and the juxtapositions and relationships made within the display of artefacts. I understand Cornelia Parker, Tim Shaw and Alex Smirnoff have been, or will be involved. How have you shared the work? HP This show has been a collaborative endeavor from the start. It was through my involvement as a contributing artist to an earlier incarnation of 'Exquisite Trove', and even earlier discussions instigated by Blair Todd at Newlyn Gallery about creating an exhibition somehow to do with the collections in the West Cornwall museums, that the idea of interleaving the two 'collections' came about. Bringing together the collection of artists' objects is the labour of Alice Herrick, and it does seem to be to be a labour of love in the best way. Alice's interest, openness and enthusiasm for art, artists, creativity and community is inspiring, and I feel curmudgeonly in comparison. Working tenaciously and calmly at the other end, Blair Todd and the Newlyn Gallery have been bringing all the museums on board and sorting out the logistics of museum visits, loan forms, display cases and so on. The selection of objects from the museums is the fun bit of course. Blair, Alice and I have visited all the museums ourselves, making contact with the directors and curators, and working up the idea of what and how the show might be. But now the selection of items for the exhibition is being done by Alex, Cornelia, Tim and myself. We had hoped to have artist Anne Hardy select for us too, but sadly she has had to pull out due to other pressures. We wanted a diversity in the selecting artists; different art, different experience, different minds. The hope is to unearth the unexpected. 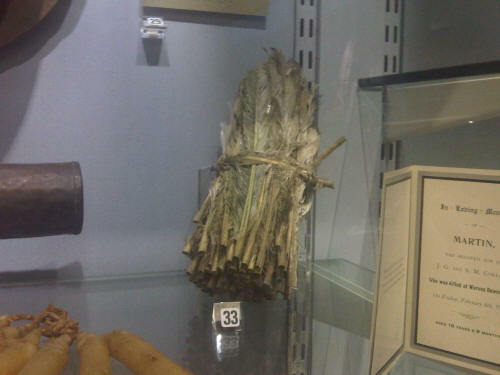 I only see what I see when I go round a museum, and this part of the process is about being taken back to a display case and have something incredible pointed out. It's about being made to look again. This is what we are engaged in now; taking the selecting artists around the museums, and seeing what comes up. Tim and Alex, as well as you Hadrian, are living in Cornwall. Has Cornelia spent some time down here too? AH Cornelia is due to visit Cornwall in June to select pieces from two museums. Cornelia was chosen due to her support, as an artist, of The House of Fairy Tales (she has a print in our portfolio), but mainly because her own art practice 'allows the viewer to witness the transformation of the most ordinary objects into something compelling and extraordinary'. Thinking about the objects from local museums: are you able to give us a taster of the kinds of things that you've unearthed so far? AH Some peculiar artefacts including a bundle of old feathers which initially appeared to have a possible link to witchcraft, but transpired to be used as dynamite holders for tin mining. A moustache cup, an egg within an egg, a skirt lifter, a mummified plague rat, a two-headed pickled pig, a walking stick made from a Narwhal tusk, a trap for three mice and an astounding amount and variety of many more artefacts! It will be fascinating to see what is selected to come to the gallery in July. HP There is so much stuff! I went to Porthcurno Telegraph Museum yesterday. It is a startling place, full of incredibly clever machines from the pre-digital age. What inventiveness! It's dusty history in some ways, but Porthcurno valley remains the site of four fibre-optic submarine cables now, so the museum retains a relevance and almost hums with communications both past and present. From this museum I hope to include a piece of brass apparatus called a Swiss Commutator (above left). It looks like a board game - a travellers chess set - or something, but as you might find it in a dream where the rules have changed and you no longer know how to play. 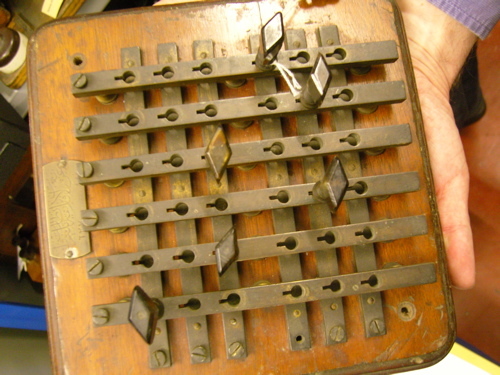 The one we might have in the show is from the museum's Store - technically it's the same concept and would have done what a commutator needs to do, but its design is different and it has a small brass plaque with Arabic writing on it that is yet to be translated or deciphered by the museum. It turned out to be mislabelled too, which caused Alan Renton the museum's curator to scratch his head, but for us that's all good! 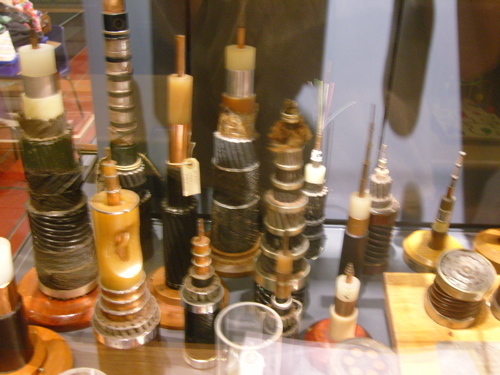 There are a lot of examples of the submarine telegraph cables themselves, in cross section and in linearly dissected form. Again, it's undeniably impressive engineering, and a tangible demonstration of 100 years or more of human resourcefulness, inventiveness and enterprise. The whole industry was dedicated making the system work without fault or breakdown - what use a dead line? A problem with a submarine cable 1000 miles across the Atlantic, and 2 miles down was a problem indeed. The museum has some examples of damaged cable - four crushed inches in a 2500 mile long steel thread, cut out and repaired, and the offending section kept as a memento and as a guide as to how to do better. For me these things are very powerful, and its the headache inherent in the object that gets to me. This is interesting, because it leads onto another aspect of what we have been finding - it's industry humanized in a way; failure and frailty running hand in hand with achievement. And then there are other things that are just, well, mad genius or desperate invention - an electric plug made out of bits of wire and ship's biscuit! Seeing is believing...and believing is to unravel an explanation or invent a plausible back-story for these things. The way objects such as these are displayed becomes a bit of an issue doesn't it? Isn't there a danger that they will seem a bit marooned in the white cube of an art gallery? objects, larger floor based and wall mounted pieces as well as things suspended from the ceiling beams. The display will be rich and playful as at Walsall. We will make the 'white cube' sing and dance whilst allowing for slow contemplation of the show! What will the show say? Do you think it will carry a message of some kind? Will it be, perhaps, a celebration of folk art, or may be a celebration of certain values - such as innocence - that might be associated with folk art? HP Helston is a Folk Museum in its best sense - it's of and by the people. Other contributing venues like Geevor Tin Mine Museum are technical or industrial museums. But whatever, its humanity, a quality of being human that comes out. This will be the same whether the objects in the show are from the museums or from the artists. If there is a confusion as to where some of the objects come from, art or artefact, then that's fine. I don't think many of the contributing artists' work is folk art, and that's not the scope of this show. The artist's objects are very consciously made or selected and represented. There is little innocence here, which is not to say that the items presented are not genuine in spirit. The artist's contributions have a relaxed feel to them I think, but this doesn't mean that the objects are not personally valuable and important. Innocence in the museum objects is again a slippery notion. In some cases there is a simplicity and basic ingenuity to an object and the job it had to do, and this seems very apparent in many agricultural or fishing industry tools or artefacts. But at the same time, by today's standards it is apparent that the actual daily work conditions of people using these tools was very harsh, whether that was a battle with the elements or with employers. At the Telegraph museum, its clear that the whole communications technology was driven by the needs of Empire building and military conquest. That's where the money came from for investment in such a high risk business. The benefits to domestic society come on later, but we don't think of culpability when we call friends in the USA for instance. If there is one word to sum up the things in the exhibition it is wonderment. AH It is a celebration and exploration of the human desire to collect and tell tales with objects and images that reflect our personal histories and a fascination with the imagined lives of others. It is a non-hierarchical display which allows artists to reveal something about themselves beyond the usual context of art and art exhibitions. Some of the objects on display have been loaned by artists' children which reflects the ethos of The House of Fairy Tales as an environment for all ages to play together. Exquisite Trove is at Newlyn Art Gallery from 23/7/10 to 2/10/10. Article commissioned for PROOF originally.